I spend most of my Saturday mornings Pinning. Some read the New York Times, watch the news, drink coffee and have a nice conversation with family or friends … I lay in bed and Pin. I live and die for you, which we all probably know by now, and the things I Pin to my Wall of Awesome are styles I actually want to try to rock, or just things that inspire my personal style. I literally just said if I had a wish right now, it would be to try on every one of my Pins … well … most of them at least. But something that really bothers me, that I can’t for the life of my wrap my head around is something that I like to call “Pinterest hair.” I define this term as messy hair styles that look absolutely chic and gorgeous. You know, one of those that looks effortless but probably took an hour to get right. Do you know how many hours I’ve spent trying to obtain this “Pinterest hair?” TOO many. It’s infuriating. These Pin-worthy messy buns look like something one would see on the runways. My messy bun looks like I had the flu, went to bed with my hair up, slept on it all night with a fever, woke up, got dressed and went out with my hair just like that. Sometimes I don’t really feel like sitting there, straightening my hair, making it perfect, or even putting some soft curls in it just for the sake of going to run errands or to do some light shopping. THIS is when I crave Pinterest hair the most. I want to be able to put on a cool outfit and just throw my long hair up like I don’t give a damn, and have it look Pin-tastic. But no, when I do it, I have bumps in all of the wrong places, or my hair is pulled back too tight making my face look odd, or I have long pieces of hair just sticking out making it look more like I’m about to go pump some iron then do some shopping. At a certain point I get so frustrated, rip the hair tie out, flip my hair over, run my fingers through it … and I call it a day. Once again, you’ve set the bar quite high, Pinterest. These girls that get Pinned are always just like, “oh my God, I’m just standing in front of the Eiffel Tower in a pair of ripped jeans, a simple white T-shirt, red lipstick and my hair thrown on the top of my head in the coolest bun ever imagined that seems like it should be easy to pull off but isn’t … whatevs.” Or “it’s cool … I’m just standing on the corner of Madison Ave. with my super amazing fish tail braid that is kind of messy but somehow stays in place while I hail a cab in head to toe Chanel … sweet.” GRR. If I were to walk around any city with a fish tail braid in, by the time I got from A to B I would look like a tornado hit me. For serious. I’ve even contemplated going to a hair stylist and having them teach me how to do Pinterest hair … yes I am THAT desperate. 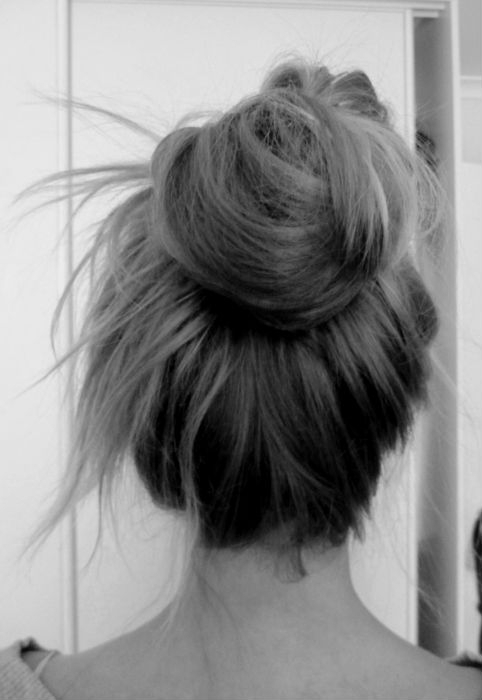 I mean for the love of God … all I want is to have a cool, nonchalant up-do. Is that too much to ask? So that is where I’m at right now, Pinning fabulous clothes and having massive, ridiculous hair envy. One day I’ll get it right, just one day.